Dice plays a part in lots of games, but I have yet to try a game where the roll of the dice feels so important as it does in Machi Koro. Everything, and I mean everything revolves around the outcome of the dice, even when the other players are rolling them, and it’s awesome! 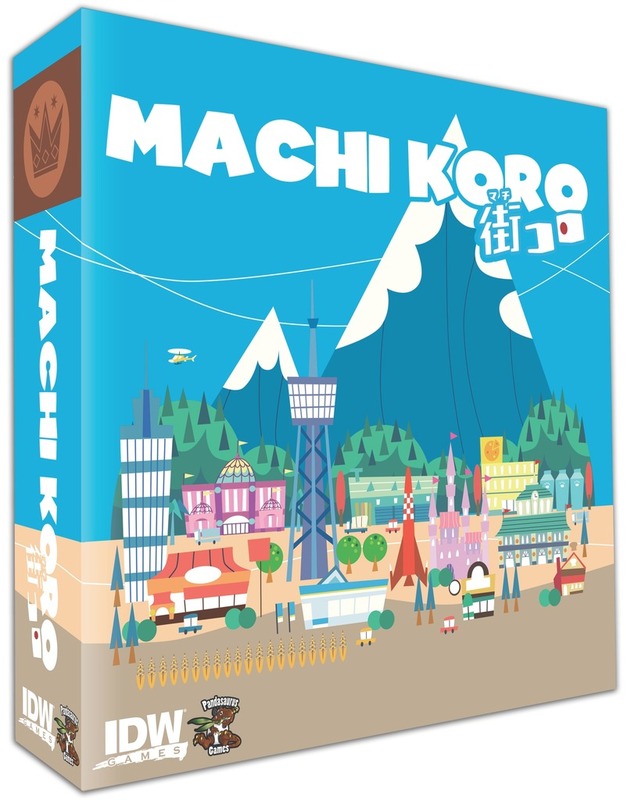 What is Machi Koro like? 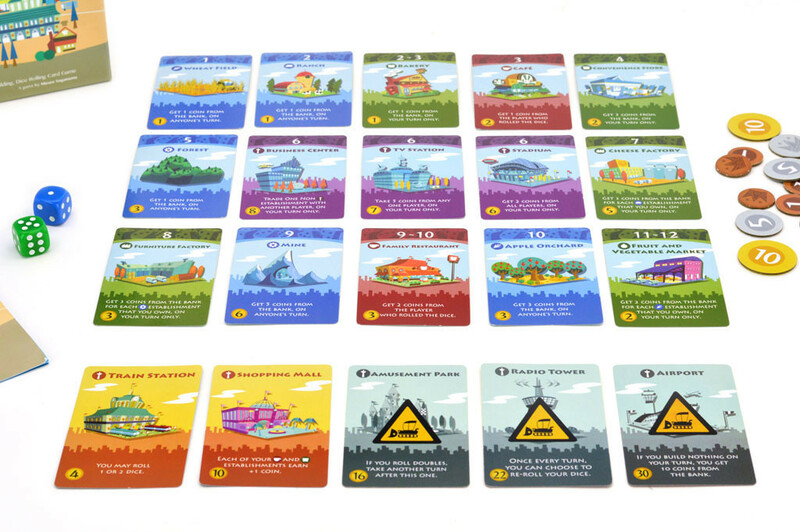 Machi Koro is pretty simple. On your turn you roll 1 die and look at the value (or later 2 dice and add the value together). If you have any blue, green or purple buildings that match that value, you get to do what the building text says (most of the time this give you coins). After you have rolled you have the option of buying one more building, and then you pass the turn to the next player. If it is not your turn you’ll still need to pay attention because any blue buildings you own will also generate coins. Red buildings only work when your opponents roll the dice, and because all those cards are restaurants related your opponent will have to give you some of their coins. The game ends as soon as one player has built his 5th landmark (each player starts with the same 5). 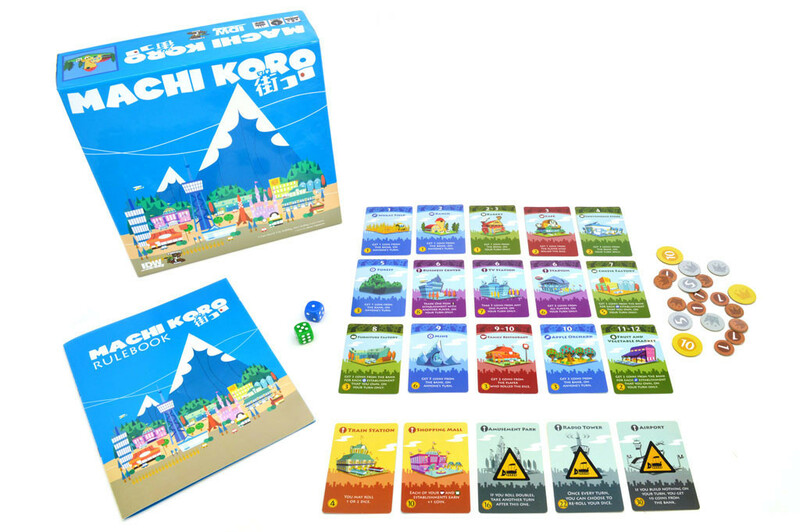 Machi Koro is a great game, no doubt about that. I was sure I would find it boring and too simple when I was introduced to the game at first, but man was I wrong. It’s just so much fun to play. Even though the dice rolls are random you still decide what to do. Will you go for covering as many values as possible to get a little something every turn or will you focus on specific buildings that will give large payouts when they are rolled? You can even build buildings that support other buildings to make them even better. But trying to do this will alert your opponents of your plans and possible set a stop to it before. The game is simple yet, deep and most of all a blast to play, and easy to teach new people. Games that rely heavily on the roll of dice have a tendency to not be fun in the long one (at least in my opinion), but as I mentioned above I don’t feel this is the case for this game, it’s actually what makes the game a lot of fun. Because you might not have control over the rolls, but you decide how to prepare for them. While rolling dice that activates “buildings” might seem a little theme less, you quickly get caught up in the game. And the fact that cards support each other (like ranches that will make your cheese factories better), also helps you feel like your are actually building your own little city. The games look stunning. The very unique style fits the game perfectly – It’s cute and whimsical, with colors that pop. The rules are well written and simple. The color coding of the cards give a nice reminder of when the activate.